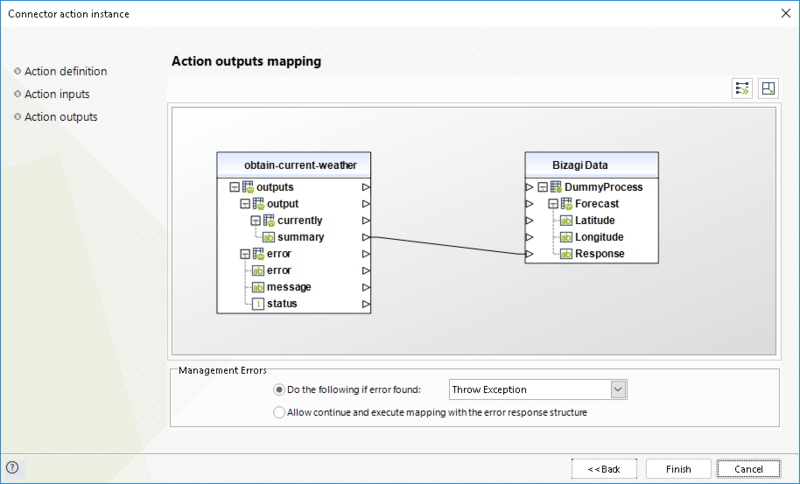 This tutorial will walk you through the steps needed to create a Custom connector for Bizagi. Custom connectors are distinguished by their offering of allowing you to write your own code. •Use any type of authentication to connect to an external service. •Include third-party libraries (Node.js packages). Through this tutorial, you will be able to create a Custom connector which does all of the above (includes a third-party library and uses a custom type of authentication, which allows you to implement what the connector does). The tutorial focuses on how to build the connector though it briefly suggest its use from within Bizagi (you need have basic knowledge on how to implement processes in Bizagi and run them). The connector is built while using the Connector Editor, as accessible at www.Bizagi.com services. It is optimal and best if you have worked with asynchronous/event-driven coding practices before (e.g jQuery and AJAX). •Understanding of basic structures such as XML and JSON. •Being familiar with web-based services such as RESTFul services. •Being familiar with package managers such as npm (https://www.npmjs.com/) -or even code/git repositories such as GitHub. 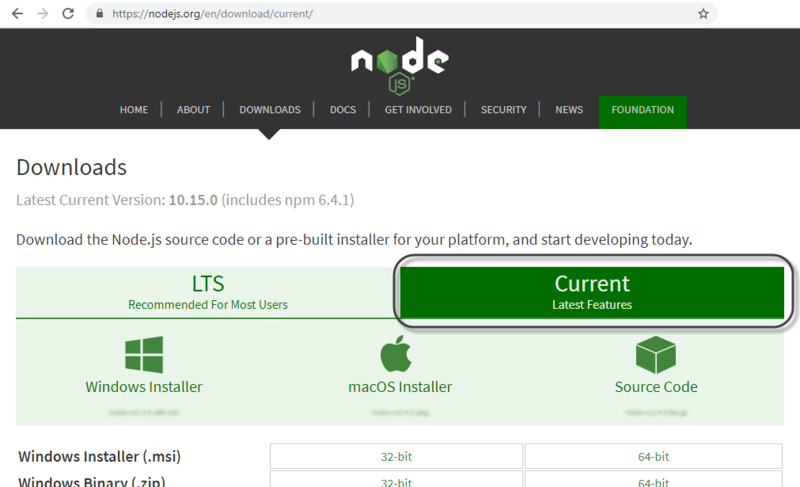 You may need to install npm and use its command prompt options to download and package any open source API (available MIT-licensed libraries for Node.js -https://nodejs.org/en/). For more information about the connectors as a feature and this specific type of connector, refer to Custom connectors. 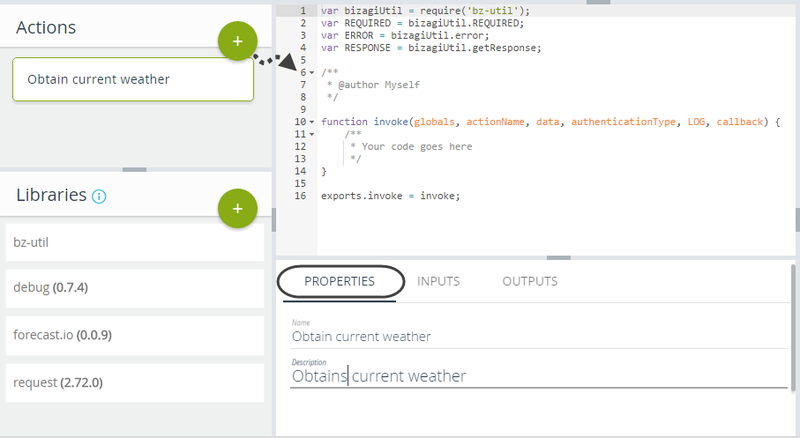 It is strongly recommended that you at least have an overview on Custom connectors, and possibly refer to the API Bizagi offers when coding it. For Custom connectors, and given that these will likely rely on third-party libraries, installing npm is required. Download and install npm directly from https://nodejs.org/en/download/. 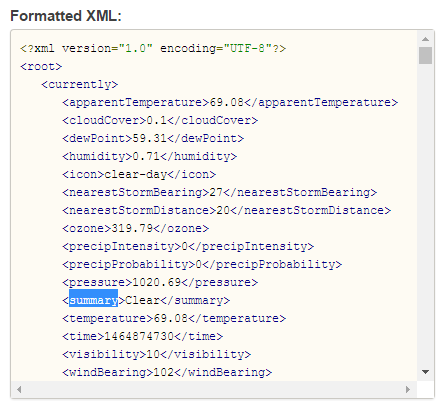 The example covered by this tutorial considers invoking a simple forecast service, in which you provide latitude and longitude coordinates to retrieve comprehensive data describing the weather forecast (by default, for the current day). 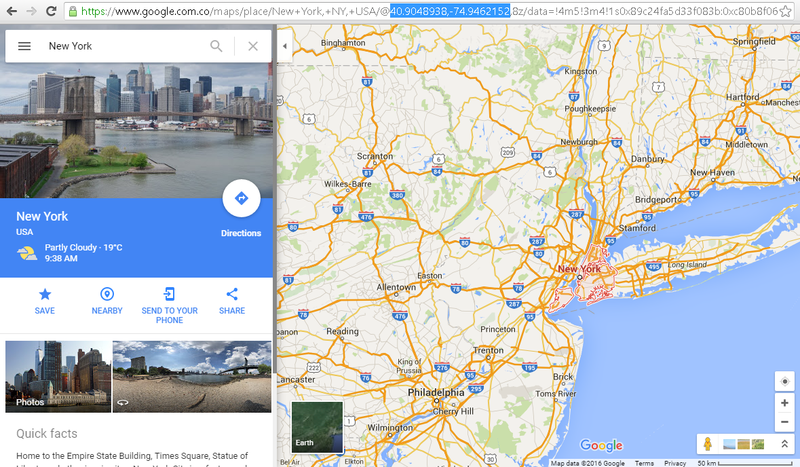 For example, the service can be invoked by using these coordinates (40.9048938,-74.9462152), which represent New York in U.S.A.
Notice that the comprehensive response providing forecast details is JSON-structured. 1.Ensuring we have a valid account and access rights for the external service (vary according to the policies of each external service). 2.Downloading a Node.js based connectivity library for that external service. 3.Re-packaging the connectivity library so that dependencies are fit for Bizagi's use. i.Configuring global parameters (i.e. authentication infrastructure). ii.Importing the re-packaged connectivity library. iii.Creating actions and specifying their implementation details (e.g, inputs, outputs and its coding). Follow the guided steps described below. 1. Ensuring a valid account and access rights. As with most external services available in the cloud, using them requires an active account on the external service's site, and explicit access rights to invoke these services via their API (mainly due to security reasons). 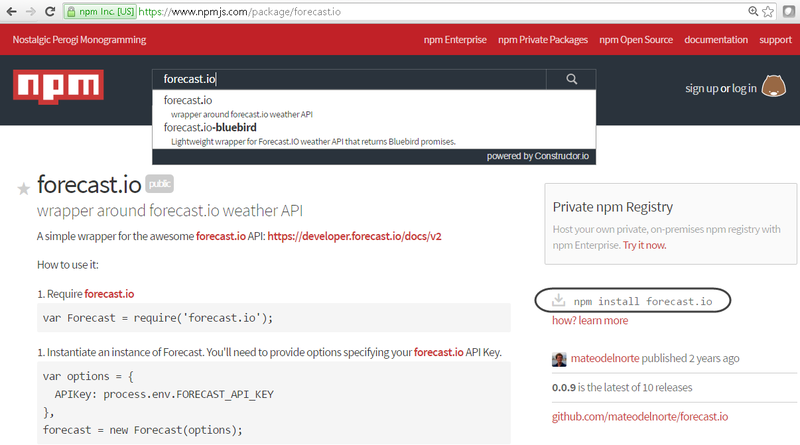 Therefore and in order to use the forecast.io service, as briefly suggested above, we need to request an access key known as API Key. 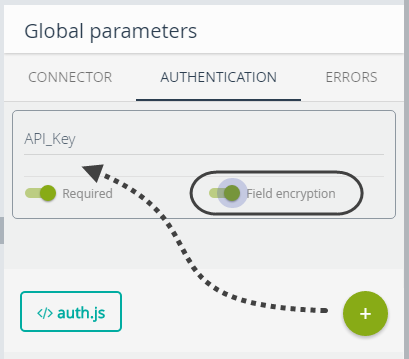 Obtain an API Key directly at https://developer.forecast.io/, by creating an account (entitles you to use 1000 service calls without charge). 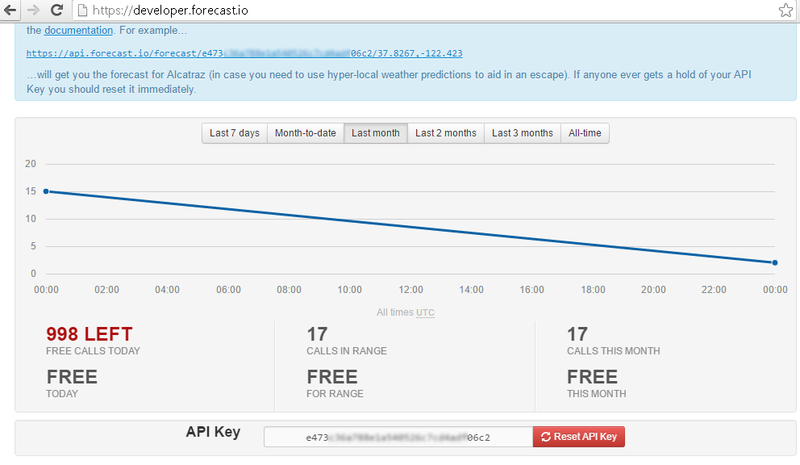 Notice that once you create an account and get an API Key, the site already suggests a sample call, shown as a link in the upper blue box, for you to click and test (using Alcatraz' -U.S.A- coordinates as an example). Always test first the services from outside of Bizagi (e.g directly from a browser or a REST plugin in it), in order to verify that these are operational and so that you can plan accordingly while acknowledging what you expect from the service, at least on a high-level. 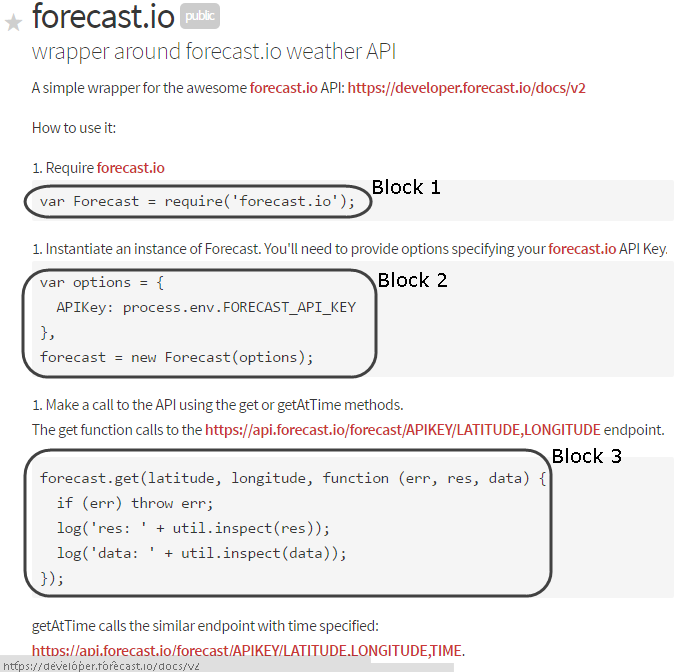 Notice this page also provides a link to its official API documentation (https://developer.forecast.io/docs/v2), which is necessary for you to understand what the connector will need to do and consider. A key potential in having connectors rely on Node.js is the agility to build them while relying on a vast amount of ready-to-use npm libraries. Therefore and in order to browse for such libraries, go to https://www.npmjs.com/. You may want to download reliable libraries, as suggested by their last modification date, number of downloads and reputation, complete documentation, availability of its GitHub repository, number of reported and solved issues, or official support. If you are still too concerned with a library's reliability, you will need to review and inspect its code. Proceed to download the library by using a command prompt, stepping into the installation path of your npm, and using npm install [unique_library_name]. It is recommended that you browse into the path where you want to install your library (i.e, a new folder you create). 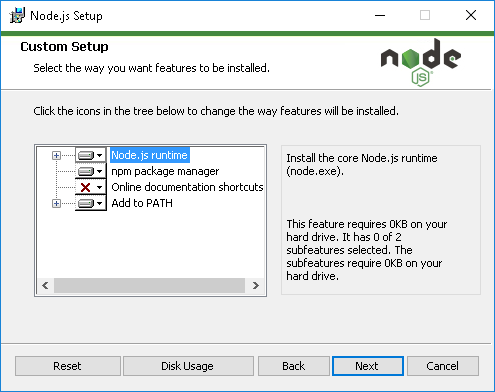 You may use a NODEJS_HOME environment variable setting to use npm commands from such directories. Notice you may use the option --greedy if the downloaded structure is not flat enough. Notice how this successful download procedure lists the other libraries that the forecast.io one uses (debug, request and other dependencies of request). These are all libraries needed for the main library to run. This step is needed if the connectivity library has dependencies with other libraries (most likely scenario). 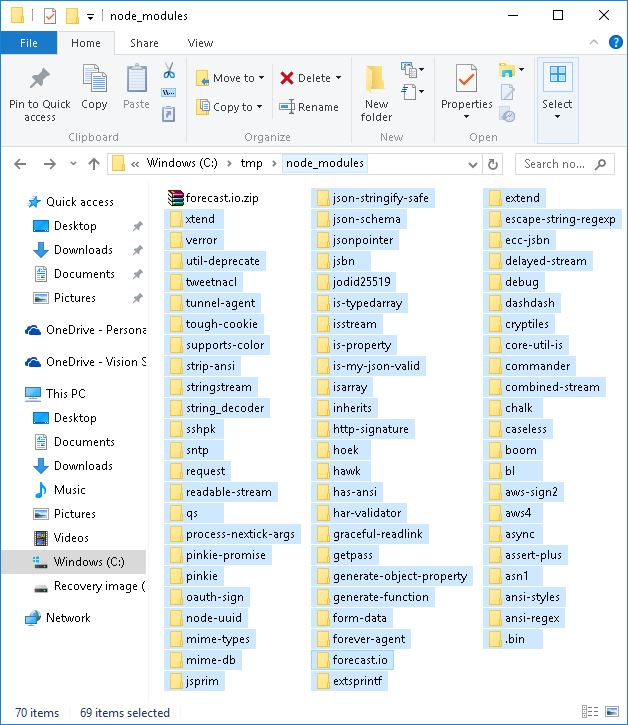 The goal of this step, is to pack the connectivity library into a single .zip file, while ensuring that libraries which are dependencies are located at the same level so that Bizagi includes them all. 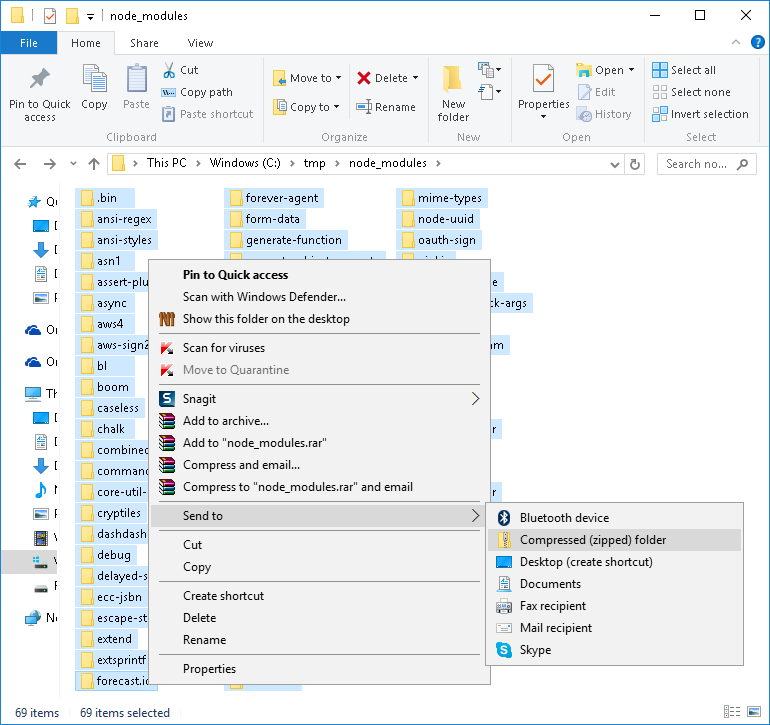 In order to do this, browse into your downloaded connectivity library and into its node_modules sub-folder. In here, you should see all those dependencies which were listed when downloading the main library via the command prompt. In the end, you should have a self-contained forecast.io.zip file that depends on no libraries, other than the ones it already bundles. As a last big step, browse into http://connector.bizagi.com/#/ in order to create a new Custom connector. At this point and before you actually get into implementing your connector, you may want to make sure you have grasped everything you need to know about the forecast service specification. •Which type of authentication it uses. •Which parameters are needed for the authentication. 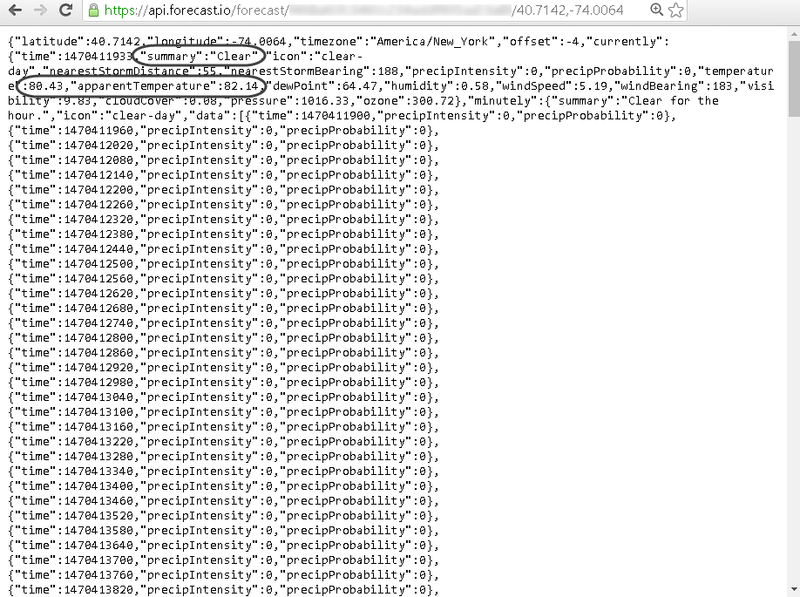 Regarding the forecast service, recall that it doesn't rely on a traditional authentication method per se, though it relies on an API Key (to be considered as an authentication parameter). There is not one single place to look up details or overall documentation regarding how to code the behavior of your connector. It is likely that you may need to browse at: the official service's documentation, the documentation on how to use the connectivity library you downloaded, and also test the service externally to get a better idea of the information it can receive and return. Importing a library may take a minute or so. This depends on the size of the library being imported. 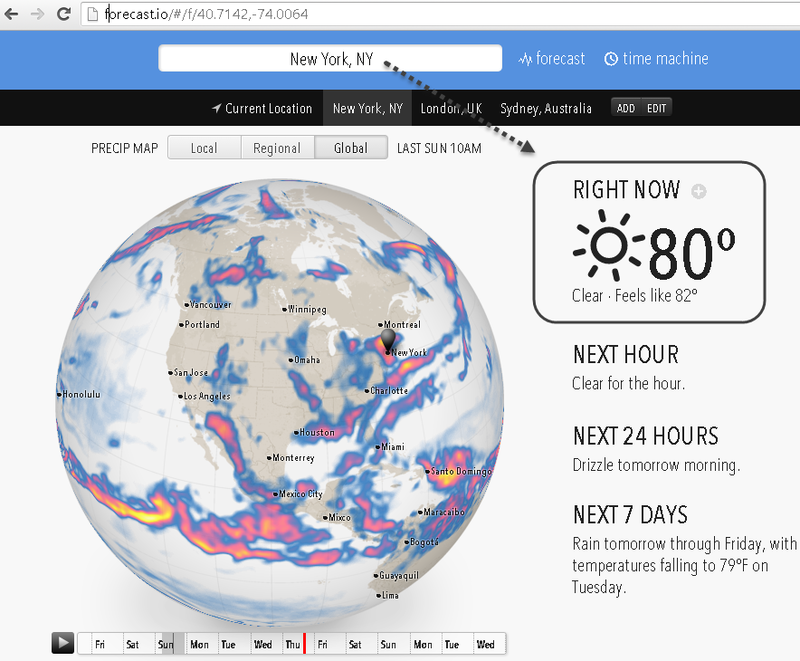 Regarding the forecast service and this tutorial, we implement the main service of looking up the weather forecast for the current day. In order to start defining its inputs, outputs or code, browse to the service's documentation or test the service as well. Notice that defining them as string and single-occurrence are best (string because coordinates may have a preceding negative sign). For outputs, we may browse the complete documentation. For this tutorial, doing a sample test invocation and working with the test results works. Notice the output is JSON-formatted and you will need to understand its hierarchical structure. Notice the way to access to such information is by navigating first into the "currently" node and then into "summary". In case you are not that familiar with a JSON-structured output, you may rely on online tools that convert from JSON to XML such as http://www.freeformatter.com/json-to-xml-converter.html. Proceed to define outputs accordingly. Notice how you do not need to create an output structure with absolutely everything that the actual service's response may return. You may choose to include only that information which is valuable to your requirements and scenarios. 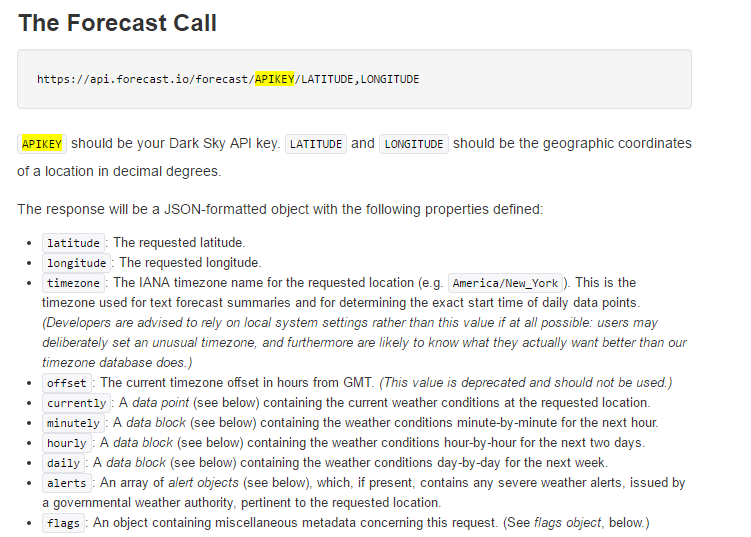 Finally, write the code that relies on the forecast connectivity library and ends up invoking the forecast service. To do so, browse the connectivity library's documentation on how to use it. 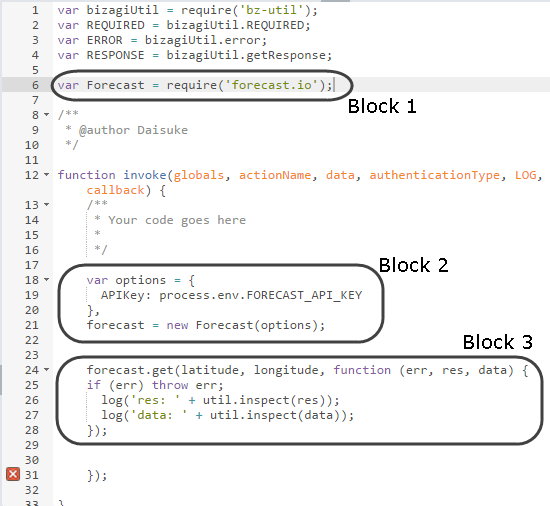 Further documentation on the actual service can be looked up at https://developer.forecast.io/docs/v2, which provides complete change-set details and others which are not as relevant for this tutorial. Note there are 3 relevant blocks of code we will be using (and modifying slightly). Modify each of the blocks as shown in the images below. Specific methods used above, and the reasons to use them, are described in the documentation of the Bizagi API for connectors. Using REQUIRED() instead of require() is a best practice so that you rely on Bizagi proprietary methods that load libraries. Getting the API_Key at execution is done by accessing global parameters, specifically the ones classified as authentication parameters. This is done throughout the globals object. 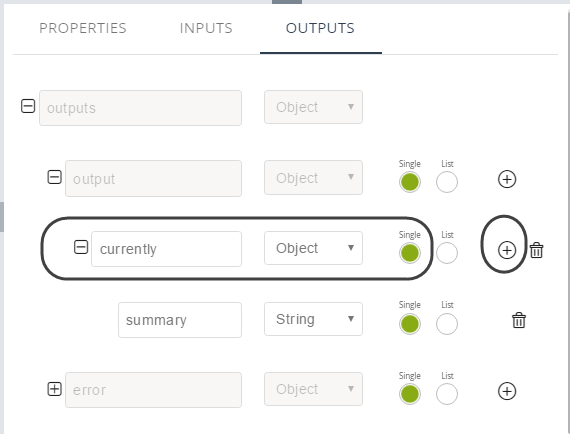 •The actual API_Key (its value) which will be configured in Bizagi Studio (or managed later on in a production environment with the Management Console). •What comes after global.authdata... needs to match the exact name given by you to that parameter (case-sensitive as well). 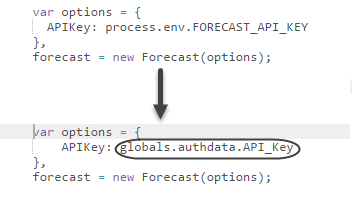 In the example above, API_Key is put exactly like that because it was its assigned name during previous steps. 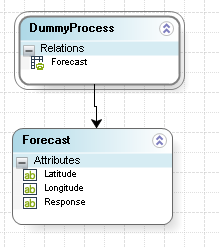 Changing latitude and longitude as parameters so that their values are obtained from the data model, is done by using the data object. Similarly, rely on the LOG object provided by Bizagi for tracing and troubleshooting purposes, instead of other types of logs (i.e instead of "log" in the initial sample code), that are used by third-party libraries. 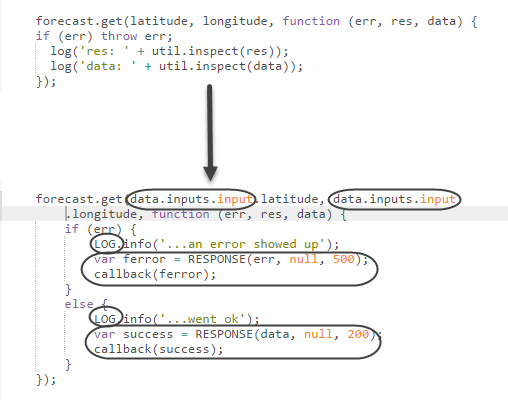 •Either for an error or successful invocation, callback() is used to notify and delegate Bizagi the response. You should never include a throw clause for error handling blocks. •What comes after data.inputs.input... needs to match the exact name given by you to input structure definitions (case-sensitive as well). In the example above, latitude and longitude are put exactly like that because these were their assigned names during previous steps. Use the Download button to save your progress into a local .bizc file with your connector's implementation. 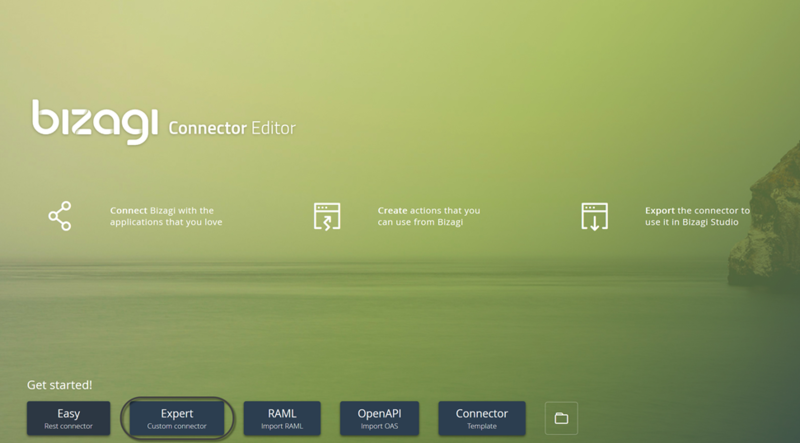 At this point, you may move unto Bizagi Studio to configure the connector and use it within your processes. Bizagi may use cached information in execution, which is optimized for a production environment. In order to avoid cache issues in your development environment, especially when performing roundtrips and changes in your connector, make sure you always increase the minor version of it when doing any modification. This will force Bizagi to acknowledge it is a new implementation, and not rely on its cached information. When done, your connector will be ready to be plugged-in to any process. 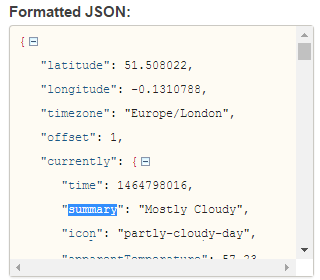 This means that in order to test this connector, you only need a dummy process with 3 string-type attributes: latitude, longitude and response (and of course, at least 2 activities in which you first capture the latitude and longitude, and then display the response as a result). 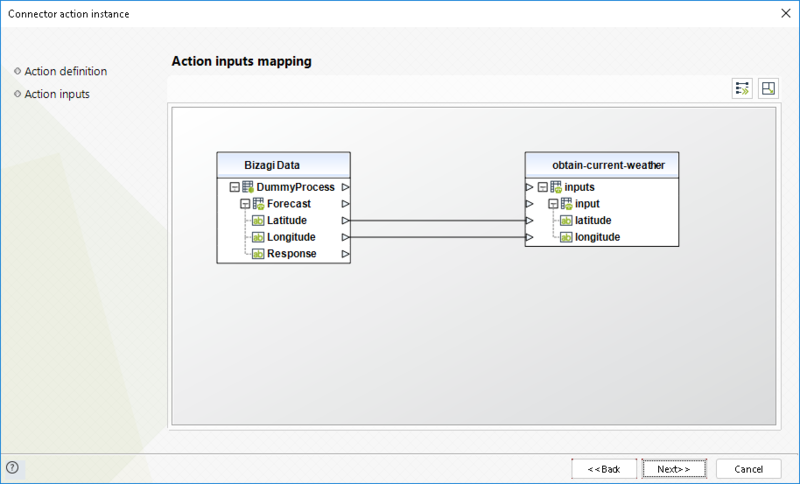 And make sure you map response as output. Recall that you may use the built-in tracing options while ensuring that you turn on traces in Bizagi temporarily and watch over your logged detail at C:\Bizagi\Projects\[your_project]\Temporary\Connectors\.